The career development – driven Latinos of Influence event was a smashing success and featured three extraordinary panelists. 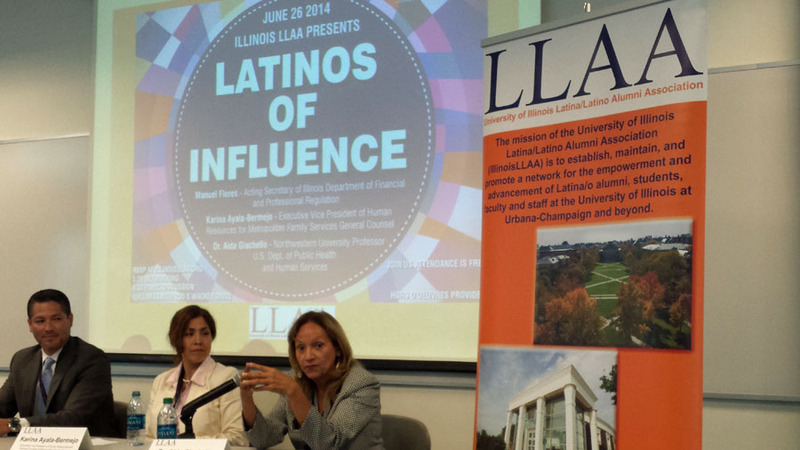 On Thursday June 26, the University of Illinois Latina/ Latino Alumni Association (LLAA) hosted the first Latinos of Influence event. The event began with a networking reception in the Illini Center’s Orange & Blue Room. Guests, including University Trustee Ricardo Estrada, were mingled and enjoyed hors d’oeuvres as the excitement in the room grew for the panel discussion. Raymond Valadez, president of LLAA, began the presentation by introducing each of the panelists, all of whom Latinos who have excelled in their career field of choice. 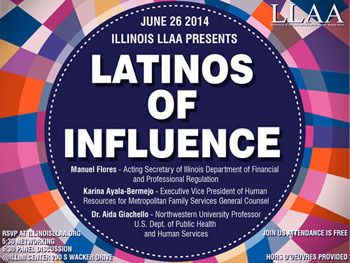 The panelists were Karina Ayala-Bermejo, General Counsel and Executive Vice President of Human Resources for Metropolitan Family Services, Manuel Flores, former Alderman in Chicago and current Acting Secretary of the Illinois Department of Financial and Professional Regulation, and Dr. Aida Giachello, Professor, Dept. of Preventative Medicine at Feinberg School of Medicine, Northwestern University. The panelists were so fascinating, the event went longer than expected, but no one minded. The insight that these successful Latinos shared was inspirational and insightful for any person looking to become a leader in their field of choice. The event, which was free to attend, captured the essence of LLAA’s mission and provided great value to the alumni who attended. Hats off to LLAA for an outstanding event! See more photos of the event on LLAA's Facebook page.